November is National Blog Posting Month. Otherwise known as NaBloPoMo, it’s the time when bloggers everywhere commit to writing daily for the entire month. While NaBloPoMo actually does occur year round, November is the “birthday” of the event. (It’s sort of the lazy step-sister of National Novel Writing Month, or NaNoWriMo.) More bloggers are involved during November than any other part of the year. Other months have specific themes. For November NaBloPoMo, the theme is simply blogging for blogging’s sake. Last year, I jumped in with two feet and ended up blogging daily for 61 days in a row. It was a great experience, and I learned a lot. Even through the holidays and the growth of my business, I was able to keep it up and find some amazing bloggers (whose blogs I still read regularly) in the process. During those 61 days, I also really feel like I hit my stride in the blogging world. Though I’ve been blogging regularly since 2007 (via this and other blogs), writing daily for two busy months taught me how to discipline myself when it comes to writing. I was more thoughtful about my posts. I planned my content and when I would write it, schedule it and share it. Guess what? Since I completed my daily writing feat, I’ve been blogging regularly ever since. I don’t have trouble finding topics to write about, and I’m better at planning my posts. In fact, I really feel like content for blog posts comes to me at this point. So, I’m joining the #NaBloPoMo crew again this year. Did I mention the prizes? According to Melissa Ford, our NaBloPoMo host on Blogher.com, there will be two prize draws per week for people on the official blogroll (add your blog to the blogroll here). Prizes include free passes to BlogHer conferences and Voices of the Year e-books. Of course, you will need to be daily blogging in order to be eligible for the prizes. So what are you waiting for? 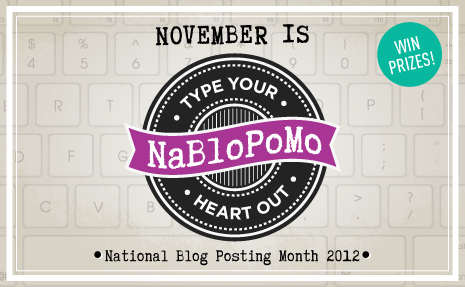 Sign up for NaBloPoMo, pick up a badge for your blog, and start typing your heart out! Aack, I don’t know! It sounds good in theory but it seems stressful, and I’m not sure I want to feel stressed about my blog when it’s so new. Thoughts? It’s definitely a commitment, but I found it really held me accountable for blogging. It’s a good way to discipline yourself and find out what works best for you in terms of writing and planning posts. I also found a wonderfully supportive community in the process last year. Don’t stress yourself out too much. Lots of people try it out and find it’s not for them. That’s okay too! Let me know if you decide to do it! jenn @ Sot this is love recently posted..Happy Halloween!!! Oh that is great! Wow, writing every single day sounds intimidating. But your words are inspiring! Thank you for sharing the links and the details. Thanks, Raquel. It’s intimidating, but it can be done! With the change in my professional life, I found that blogging regularly became more difficult. I’m hoping another month of NaBloPoMo helps me not just get back on track, but find ways to make my blogging fit into my new daily routines. Don’t know if I’ll have the stamina for two months in a row, but I’m hoping so! Happy blogging! I’m not sure if I’ll make it another 2 months either. We shall see. We’ll have to keep each other accountable throughout the month! There’s no word count requirement! You just have to post daily. It’s an interesting test. You should try it! I did A-Z in April and came to love writing every day. But I’m afraid this is just not the right time of the year for me to commit to writing every day. We’ll be traveling later in the month and with the holiday’s it’s just not a good idea. But I’m so looking forward to reading all your post Jennifer! Good luck.. Thanks, Jen. The holidays and travel definitely make it difficult. Planning ahead is essential! So now I’m torn between the blog posts and the writing. Is it weird that I feel like I could write just to write more than I could to blog? I don’t know…ack! I say as long as you are writing, you are good! I am so nervous about this month’s NaBloPoMo…I just completed October’s challenge (my first NaBloPoMo) so now I have a (sort of) standard set, I want to be able to complete this one too! Eep! How scary! But in a good way, right? You got through last month. That’s great! THANK GOODNESS SOMEONE ELSE IS DOING THIS CRAYCRAY STUFF WITH ME. I’ve only seen one other person do this and that’s the person who got me into it and even though there’s so many blogs out there on that blog roll this is the first one I’ve come across from another source! I think the prompts are a little… dry. So I’ve implemented me own to keep me going throughout the month. I usually only blog MWF and save the other days for free write, boredom or other scheduled things. That still left me with 22 days I needed to fill. YIKES! I can’t believe you’ve blogged for 61 days straight… that’s intense. Wish me luck! Sara Ivy recently posted..November is National Blog Posting Month? I’m not good with the writing prompts either. But I found once I got into the swing of things, content just came to me. I also found it helpful to read other #NaBloPoMo posts via Twitter. This is my first time attempting it! I’m nervous, but think I can do it! I already post at least four days a week on my blog. The weekends will be the tough part. Weekends are tough. I’ve been giving myself the weekend off. Time to start planning ahead. Good luck! Amazing! Every year I’m tempted to do this, and every year I chicken out! I want to do this! One day, one day!